If you’re just getting started learning guitar, learning a new song might feel like a daunting task. It might feel like an impossible challenge to learn all the guitar parts and be able to play the entire song. But with the right method you’ll learn to get through even the most challenging songs. In this article let’s look at a step by step method you can follow to learn a song on guitar. Q: How quickly can I learn to play a song? If you follow my method step-by-step, you’ll learn in an incredibly efficient way. This means you’ll learn much faster than other methods. But how long it takes to learn any song depends on how complicated the song is, how many parts are in the song, how often you practice and how much you focus during your practice. Don’t look for ways to learn faster, because you’ll end up with sloppy technique and bad habits. Would you rather play a song poorly or take a bit longer and play it right? Don’t be in a hurry to learn a song – take your time and get it right the first time. If you can be patient and stay dedicated during the learning phase, you’ll end up as a far better guitarist. Q: How can I learn a song by ear? For beginners and intermediate guitarists, learning a song by ear is incredibly difficult and time consuming. The method I give you in this article doesn’t require you to figure anything out by ear. It’s perfectly fine to learn songs from TAB and transcriptions. As you develop your skills you will eventually get to the point where you can learn a song by ear if you want to. But for now, don’t put that pressure on yourself. Q: How can I learn a song in a week? Let’s say you need to learn a song in a week for an upcoming performance. While I don’t recommend trying to rush through and learn something quickly, if you’re dedicated you can learn quite a lot in a short timeframe. The trick to learning a song in a week is to schedule short and regular practice sessions. You might think you’re doing a great job by practicing for 3 hours straight, but research shows you would be wasting over 2 hours of that practice session. Instead of having long practice sessions (eg: anything longer than 30 minutes in one sitting), aim for short practice sessions with breaks (eg: 15 minutes practice, 5 minutes break, repeat). Short practice sessions with lots of breaks is significantly more effective than long practice sessions. You will be able to memorize the guitar parts faster and develop your skills with less hassle. I’ll talk about this more in a different article, but for now just remember to keep it short and regular. Guitar Pro is a powerful software suite designed for guitarists to learn songs, write songs and jam along with songs. I used this program when I was a beginner to learn and practice new songs and I still use it almost every day today. It’s my top recommendation for all guitarists because it can have such a big impact on your skills and understanding of music. The above screenshot gives you an idea what Guitar Pro is all about. In this screenshot I’ve download the transcription for a song I want to work on. I can see all the guitar tracks for the song (the red bars at the bottom), I can see the parts in TAB as well as standard notation, I can see the guitar’s tuning on the right (this song uses a 7 string guitar) and I can play the song back to hear how the parts sound and to play along. Instead of having to work a song out by ear or buy a book, I can easily access everything I need to learn and master the song in this program. There are a lot of handy tools and features in Guitar Pro and I’ll explain how to use them later in this article. 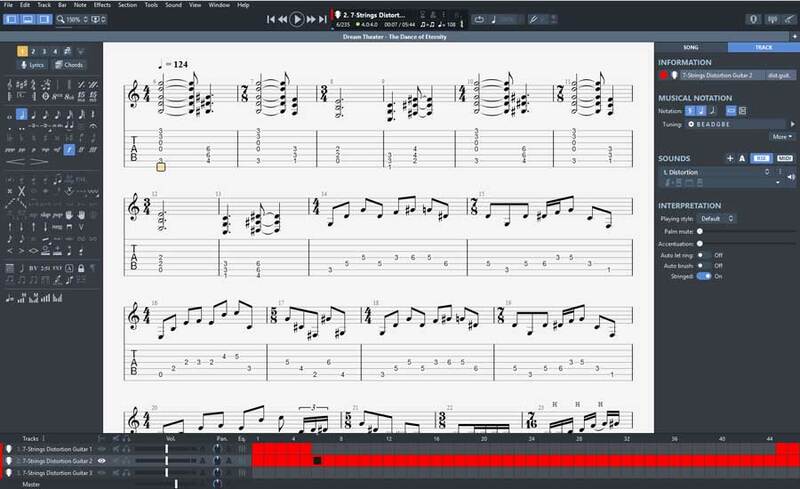 Download the latest version of Guitar Pro here. Once you have Guitar Pro up and running, you can move on to Step 1 and start learning songs. If you haven’t heard of the site already, check out Ultimate-Guitar.com. They have the largest collection of song transcriptions online – all for free. As an example I’m going to show you how I would learn to play the song ‘Enter Sandman’ by Metallica. There are a lot of different parts to this song so it’s a good example. You can follow the same steps for easier or harder songs. What we want is to download the most popular Guitar Pro version. If I click the ‘Guitar Pro’ option highlighted above, I can see there are a few Guitar Pro versions with different star ratings. There’s one with 453 ratings and four and a half stars so that’s a good one to go for. Download the Tab file and save it somewhere you will remember for later on. In this song you can see there are two guitarists (James Hetfield and Kirk Hammett) and different tracks for different guitar parts. This is helpful if you want to focus on different types of parts such as the rhythm or lead tracks. Have a look through all of the guitar tracks and start writing down all the different riffs/chord progressions you find. Some songs will only have a few different parts while others can have a lot of different parts. Having a checklist of all the different parts in the song gives you something you can aim for and tick off as you go. Being able to cross a riff or progression off as you learn it makes the entire process a lot more fun. While there are other parts in the song such as some extra lead licks, learning the above parts will get you through the entire song. Once you have your list of parts written down as a checklist, take a look at each part and mark on your sheet how easy/hard they look to you. Some parts will be harder than others so it’s good to know before you start which parts are going to take longer and which parts you’ll be able to get through quickly. For example the solo in Enter Sandman is easily the hardest part of the song and it’s quite long. On the other hand the verse riff is extremely easy and can be learned and mastered very quickly. If you want you can also rank all the parts from easiest to hardest. Then you can decide whether you want to tackle the hardest parts first or start with the easiest parts and work your way to the harder parts. If you’re unsure which way to go, I recommend starting with the easiest parts because it will feel far less daunting and you’re less likely to give up. If you follow these steps, you’ll learn the parts faster and easier than just trying to play along with the song as I’ve seen a lot of beginners do over the years. Your first goal with any of these parts is to memorize the notes/chords. Memorizing the parts first makes it easier when you get to building up your speed as you’re not going to forget anything as you go. You also probably don’t want to stand on stage with sheet music in front of you, so memorizing the parts is worth the effort. 0 7 5 6 5 7 0 7 5 6 5 7 0 7 5 6 5 etc. E E G Bb A E E E G Bb A E E E G Bb A E etc. Why do this? Memorizing the order of the notes (or fret positions) before you try to play anything on guitar will make it so much easier when you actually try to play it on guitar. Not knowing the next note is the most common issue students have when they’re learning a new part. There’s nothing more frustrating than playing everything perfect then getting stuck because you forgot what the next note is. Spend some time calling the note names or fret positions out loud until you feel you have memorized the order. Now you can try to play the parts on guitar with focus on which fingers you should use. For example in the above riff, which fingers do you think you should use to play the 5th, 6th and 7th frets? You definitely wouldn’t want to use the same finger for all of the notes, so what makes more sense to you? What if you use your first finger on the 5th fret? Then what would make sense for the 6th and 7th fret notes? Learning to figure out which fingers you should use might be frustrating at first, but the more time you spend thinking about it, the quicker you will learn to figure it out for other songs. Try a few different finger positions and learn why one works better than the other. You might be tempted to find a lesson that tells you exactly what fingers to use, but don’t do it! It might feel easier at first, but you won’t learn why it feels right and you definitely won’t learn to figure it out on your own in the future. Trying to play the part at full speed as soon as you have memorized the notes is a mistake. Take your time and get it right. Play it as slow as you need to be able to play it perfectly. It’s okay if you need to stop and start, but never rush. At this point you want to let the parts sink into your memory. Play them over and over at a really slow tempo and use the same finger positions every time. Once you can play the part over and over from memory without any mistakes, you might be ready to try and build up your speed. 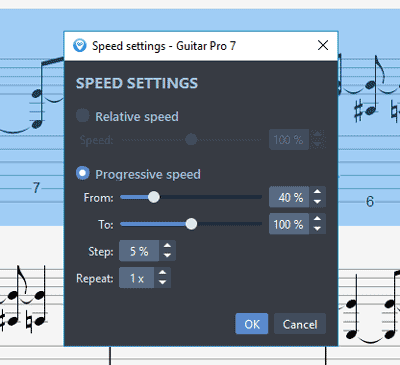 Guitar Pro has a tool that allows you to loop parts and gradually increase the speed each time you repeat it. This is an excellent way to develop your speed and control over the parts. I used this tool when I was a beginner learning basic parts and I still use it today for complicated lead parts. You can highlight any part you want to work on, so if you want to only work on part of a long solo or a few chords in a progression, just highlight those parts. If you press play now, the highlighted part will loop over and over. You might be able to play along with it now, but you’ll develop better skills if we start at a slower speed and gradually build the speed up. Click on ‘Progressive speed’ to set up the speed trainer. The idea with this tool is it will start playing your loop at a certain speed, then gradually change it until it reaches the end speed you set. In the above example I’ve set it to start the loop at 40% speed, then after each repeat it will increase the speed by 5%. It will keep looping the part and increase the speed by 5% each time until it reaches 100% speed. Play around with different settings to learn how the tool works and what speed works for the parts you want to learn. 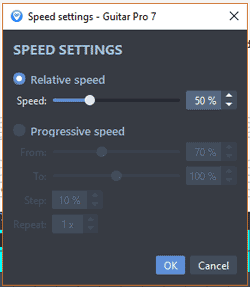 Set the starting speed slow enough that it feels too slow. That way you start off nice and relaxed. As the speed gradually increases, you’ll start to feel more pressure and need to focus more. Eventually you’ll either find you start making mistakes, start rushing or you reach 100% without any problems. If you do start to feel like you’re rushing, making mistakes or playing sloppily, stop and start the tool again. Every time you use the speed trainer, you’ll get a little bit better and will feel more comfortable at playing the parts faster. The important point to remember is to not rush. If you rush, you might be able to play the part at full speed, but you won’t be in control of your playing and it won’t sound good to others. Take your time and gradually build your speed up over a few days. Extra tip: after you think you’ve mastered the parts and can easily play them at 100% speed, try playing them at 110% speed. This is a good way to test how well you really know the parts. If you really have mastered them, you should be able to easily play them at 110% speed without feeling like you’re rushing or struggling to keep up. On the other hand if you make mistakes, rush or struggle to keep playing in time, that’s a sign that you haven’t yet mastered the parts and you should spend a bit more time working on them at a slower speed. Once you have ticked off all of the parts on your checklist, it’s time to start putting the parts together. Getting used to connecting all the different parts together will be easy in some songs and difficult in other songs. So you might spend 10 minutes at this step or you might spend a few days, it all depends on the song. Look through the song to count how many times you need to play each part before you move on to the next part. If the song is complicated you might want to write down how many repetitions for each part to help you memorize the order. At this point don’t play along with the tracks – you want to test your memory and see how well you can connect the parts together without any support. Don’t look at the TAB and start playing from the first part. Try to remember how many times you need to repeat it before you move on to the next part then keep going through the parts until you’ve gone through the entire song or you get stuck. Once you can play the entire song on your own with the correct number of repetitions for each part, move on to the next step. Now it’s time to really play the song. Guitar Pro allows you to easily play along with the song and it’s a great way to tighten up your timing and get used to playing along with any other instruments in the song. Then in the future if you want to play the song with other musicians, you’ll know what to expect and find it far easier. If you have followed the earlier steps properly, you shouldn’t need to look at the transcription while you play. Have the Guitar Pro file playing, but avoid looking at it to really test whether you’ve properly memorized the parts or not. If you get stuck at any point, spend some more time working on those parts. Playing along with the other guitar tracks let’s you hear if you’re playing the parts properly. If what you play doesn’t perfectly match up to the guitar parts you hear in the Guitar Pro file, that’s a sign something is wrong and you need to look a bit closer at those parts. Start off by playing along with all tracks active so you can hear the guitar parts while you play over the top of them. Do this until you feel comfortable with the song and don’t feel rushed. Guitar Pro allows you to mute any track you want. This means we can mute the drum track, mute the bass, mute any vocal tracks or mute the guitar tracks if we want. Once you feel comfortable playing along with the song with all the tracks active, mute all of the guitar tracks. Depending on the song, this means you will only hear drums, bass, keyboards or any other non-guitar instruments. For some acoustic songs this might even mean there’s nothing playing. In that case I recommend turning on the metronome (Sound > Metronome). Learning to play the track with the guitars muted is crucial to properly learning the song. You don’t want to get too used to hearing the guitar tracks in the background while you play. Imagine trying to play a song in a band and not being able to do it unless another guitarist played along with you. Muting the guitar parts helps you learn to listen to the other instruments and match up what you are playing with them. If the song you are learning uses bass and drums, spend a few minutes listening closely to those tracks before you try and play along so you get a feel for what to listen for. Quite often the bass parts match up with the guitar parts so that makes it easier to play along with. 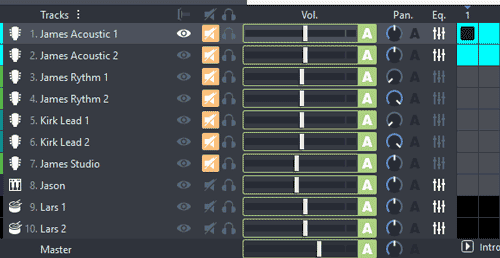 Notice that the muted tracks have the speaker symbol highlighted. When you hit play, you shouldn’t hear any guitar parts at all. The song might sound strange at first because you’re probably not used to hearing it without guitars, but you will get used to and feel comfortable adding in your guitar parts. If you get stuck you can always add some of the tracks back in, but the goal is to be able to play the song without needing to listen to any of the guitar parts in the background. Sometimes that means you’ll need to play along with a metronome and other times it means you need to listen carefully to the drums. At this point you should congratulate yourself for being able to play the song. If this is the first time you’ve learned an entire song, that’s a great achievement. While you might be tempted to move on to the next song, I highly recommend spending some time ‘polishing’ your playing. As a guitar teacher I often hear students say they know a song, but when they play it they don’t play it as well as they should be able to. Just because they can get through a song doesn’t mean they played it well. The best way to find out how well you know the song is to record yourself playing it. When you listen back to your playing, you might be surprised with what you hear. You’ll suddenly notice mistakes you didn’t notice while playing, you’ll hear issues with your timing and you might notice some parts just don’t sound quite right. That’s normal and you shouldn’t stress. It takes time to truly perfect a song and learn to play it flawlessly. Recording yourself uncovers all the areas you need to spend a bit more time working on and perfecting. There are a lot of different ways you can record yourself. You don’t need a high quality recording – you just need something clear enough to hear what you played. The chances are you will have at least one of the above points available right now to record yourself. It doesn’t matter if the recording isn’t good quality, it just needs to be good enough to hear what you’re playing. For any parts you need to improve, the best way to improve how they sound is to slow them down when you practice them. This will stop you from rushing and force you to really focus on every single note and chord. Take your time and resist the temptation to play the parts at full speed. With this setting the entire song will play at the speed you set. Highlight the section you want to work on, loop it and set a speed slow enough that you can really focus on what you’re playing. At this point you’re ready to move on to the next song and repeat the steps. But that doesn’t mean you’re finished with this song. Every time you work on the song, you will get a little bit better at it. Even advanced guitarists keep practicing songs they already know to keep improving. Steve Vai has said in interviews that every time he plays his songs live, he gets a little bit better at playing them. The point to remember here is that we’re never really done with learning a song. We can always get a little bit better and if you try to keep improving at the songs you already know, you will become a far better guitarist. Never think that you’ve mastered a song and you don’t need to practice it anymore. Always try to play it better and sharpen your skills. Now that you’ve read through this method, you might want to favorite or bookmark this page so you can keep referring back to it whenever you want to learn a new song. Follow the steps and you’ll learn each song in less time and with much more control over your playing.